One of Susan Sentler’s latest creative moves is ENFOLD, a multi-media installation performed at the ArtScience Museum in Singapore. 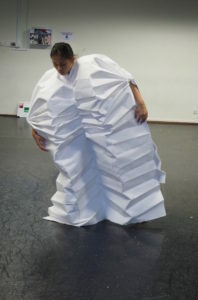 Taking the concept of ‘folding’ as a starting point and expanding it through the technique of origami, the performances is rooted with the visual, sensorial and kinetic embodiment of the designs, inspired by Minimalism. The idea for the work signs of a nest began with artist Susan Sentler responding, noticing within her new environment, Singapore. Having moved numerous times in her life, Susan experiences a sense of ‘home’ through images that trigger an embodied anchoring, allowing her to be open to the new, but space to reconnect with her carried past. She was intrigued by the beautiful HDBs (housing development board, public housing) throughout Singapore; especially those that were to be torn down, demolished to build new…a constant desire of Singapore to eliminate the old, the dilapidated, the worn. Susan was drawn to the incidental and unnoticed beauty of small details, signs in and around the apartments; and how these would disappear, only to be remembered in the virtual image. Susan also was intrigued in how people would find rest throughout varied areas within these environments. She wanted to hone in on the way in which the body could nest, find a place of rest, of home…even momentarily. She exhibited signs of a nest first within Abeerance#8 at Southwark Platform in London/UK, June 2016. The performance here was an hour in length, the performer Stella Papi. The work was then performed for a longer duration of 4 hours within the monthly opening event at the venue Substation in Singapore, December 2016. The title of the series being Performing Home. Exploring triggers of dwellings; unnoticed fragments. Signs of a nesting space. ‘Space’ being a place of belonging. The work reflecting on how these ‘signs’ are becoming lost in their material sense, only to be held in that of the virtual, but resonate in the landscape of our bodily memory. The ‘nesting’ seen as an abstracted, repeated ritual, allowing the body to mark its territory. Referring to the French historian Michelet, the form of the nest is commanded by the inside. Bachelard (1958,101). The embodied imprint becoming one with the material of the place. The exhibition is composed of film, photographic stills and live performance. Bachelard, G. 1958. The poetics of space. Beacon Press, Boston.